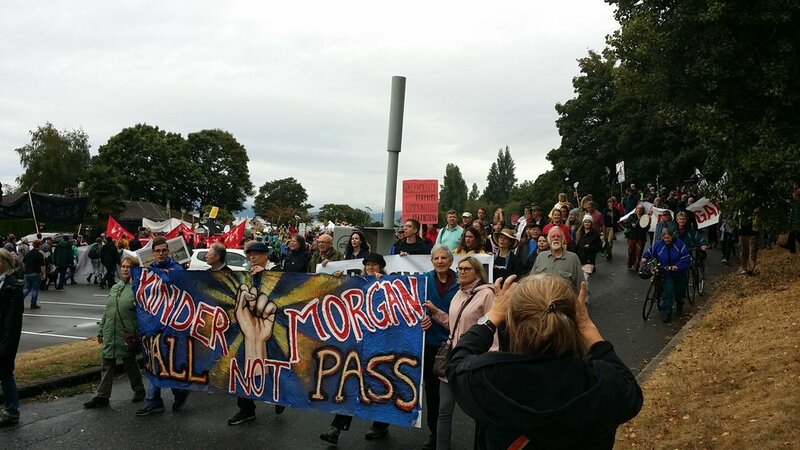 Inclement weather didn’t dampen spirits of the many who attended the Kinder Morgan, We Say No! March & Rally on Saturday, September 9, 2017. 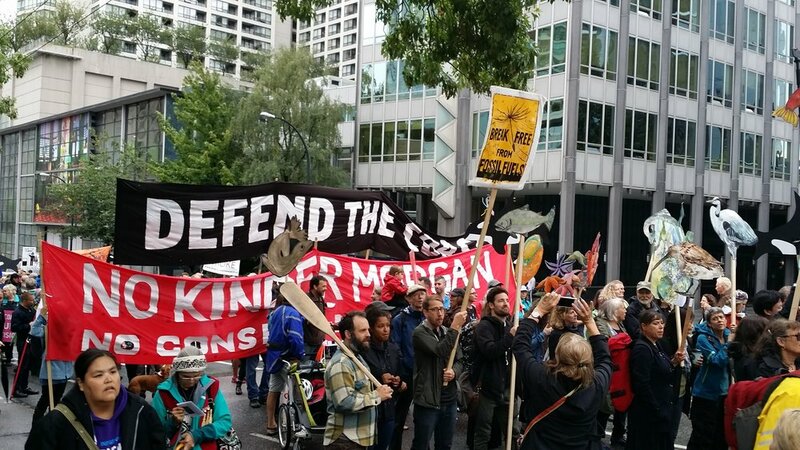 Organized by Climate Convergence Metro Vancouver, the event followed on from the No Consent, No Pipelines protest (of November, 2016) and marked the official approval by the National Energy Board (NEB) of Kinder Morgan’s Trans Mountain Pipeline expansion. With the strong support of the Trudeau government, the pipeline project – which would increase tanker-traffic in Burrard inlet seven-fold and put the coastline of Vancouver and the Salish Sea at risk of a catastrophic oil spill – was given the green light by the NEB over widespread criticism that the assessment process was deeply flawed and biased in favour of approval. The event, held on unceded Coast Salish territory, was endorsed by a wide and diverse range of groups (including the Social Justice Centre at KPU). Kick off began at the Vancouver Art Gallery with a rally, which was followed by a march through the streets of downtown Vancouver and the West End, culminating with a further rally at Sunset Beach. Indigenous drummers headed the march, followed by organizers carrying beautifully-made representations of the various creatures that inhabit the Salish Sea. The Carnival Band brought up the rear with rousing musical accompaniment. An abundance of banners and signs proclaimed their opposition to the pipeline (including such poignant reminders as “There is no Planet B”) and raised the call to “Defend the coast!” as well as for divestment from fossil fuels. Chants included “From Standing Rock to BC, make the land pipeline free!” The rally concluded with indigenous drummers and singers ringed by attendees linked in a wide circle. Numerous First Nations leaders addressed the crowd, including Shane Point (Ti' te-in, səl̓ilwətaɁɬ ‎Tsleil-Waututh, Elder‎ with the Musqueam Indian Band), who opened the rally with a traditional prayer and stressed the need for a class action law suit against Texas-based, Kinder Morgan, a theme also taken up by other speakers. Linda Williams (Skwxwú7mesh ‎Squamish Elder Squamish Nation; Ta-ah (Amy George), ‎səl̓ilwətaɁɬ ‎Tsleil-Waututh Elder Tsleil-Waututh Nation Sacred Trust; Chief Robert Chamberlin, Owadi, Vice-president of the Union of BC Indian Chiefs (UBCIC); Kanahus Manuel, grassroots community organizer from the Secwepemc Nation, founder of the Tiny House Warriors – also spoke with passion about the spiritual connection between indigenous people and the land, the potentially devastating impact to their territory in the event of a spill, and the need to protect the environment for the generations to come. Other themes espoused included the link between defending the environment and reconciliation between indigenous people and Canada, as well as the requirement for the free, prior and informed consent of all first Nations along the pipeline route. Across speakers, the threat of climate change, the need to transition from fossil fuels, the importance of respecting the rights of indigenous people and the lack of social license for the project were taken up, including by anti-poverty activist and Vancouver city council candidate, Jean Swanson, and Kennedy Stewart, MP for Burnaby-South. While not of the size of the earlier march in opposition to the pipeline expansion, the event was still a clear indication that people have not acquiesced and will continue to act to prevent this threat to the local environment and global climate from being realized. Newer PostA Subtle Revolution: What Lies Ahead for Indigenous Rights?